Differences between a blog and a website are highly searched in today's online arena. Blogging/blog terms are so intensely used around the net, that many newbies get stuck on the point here. So i thought why not to mention the basic differences between the two ways by which we can publish our content online. To summarize, blog is a type of a website (Web log= Blog). Website is a general term. (site on web=website). You might have heard about those static sites and dynamic sites. That idea supports the Blog vs Website theory. There are few technical differences, as to how the data is presented to the readers. We would also discuss couple of reasons due to which blogs are highly considered now days, to present data online. However, what some of you might not be aware of is the major difference between the two and how these two make a difference to the global world with their presence. Let me put some light to the major differences between a blog and a website. And yea, if you are wondering about the eBook series, its not finished yet. In fact we are onto the interesting part. So stay tuned for it in the coming days. Its always better to change some taste. Isn't it? Examples of blogs are famous news magazines such as buzzfeed, techCrunch, Lifehacker or news sites such as The New York Times, CNN, BCC etc. that publish stories on daily basis. Or even sites ran by individuals on a specific niche such as this blog! Examples of websites is everything that exists on ! Because a website is the mother term given to all sites that you browse online including the blogs. Whether it may be social media networks like Facebook/Twitter or Ecommerce sites such as eBay, amazon, Alibaba or community forums such as stackoverflow, Google forums or Quora. series of latest posts in reverse-chronological (latest to oldest) order. Bloggers often prefer to show around 8-12 recent posts on their blogs main (home) page. Where as there is nothing such in a static website. Even if a website is about tutorials (like Lisa Arby's popular website, 2createawebsite.com). The website was launched years ago, when the blogging wasn't quite into the online world. She did a pretty neat job with the sequence of the content. Interlinking was perfect. You could take a look to that site, in order to get to know the feel of a static website. The major difference between the two types, blog and a static website is about the content refreshment. The major content of website remains the same. Though the webmaster could add additional pages to the website to increase the content, but the order by which the information is presented could not be later changed. (isn't changed). That's where blog have started to gain popularity. Have you ever thought about the way you search internet now days? You either follow a specific blog right away (through bookmarks) or in most cases, you search search engines. Search engines help you to get to a specific question (like how to add bla bla to blogger). It would take you to the static page, with the best information of the particular topic, either it comes from blog or website. So the content is basically searched the same way as before (through search engines), but blogs provide a different dimension to the way information is presented. Another huge aspect of blogs due to which people have adopted them, are their ability to get crawled by search engines frequently. As the posts are updated on daily basis (sometimes many times in a day), so search engines crawl blogs many times a day in order to fetch new content. Blog Vs. Website: What's The Difference? These are five ways you can identify a 'Blog' when compared to any website found online. A Blog offers a subscription system to send free email newsletters to readers. Articles inside a Blog are organized through categories and tags. Articles in a Blog appear in reverse-chronological order, latest to oldest. A Blog is managed by an individual author or a team of authors often called the editorial board. If you see a comment form at the bottom of a webpage, know that you are reading a blog. Blog comment forms are a great way to interact with the author and share your insights or ask him queries regarding the blog post. These comment forms could be simple text boxes with fields for Name, Website/Email, Message. Or it can be a third-party comment plugin powered by Disqus, Facebook or Google+. Blogs are more like newspapers. Covering a vast variety of topics and publishing several articles each day or each month. Visitors to blogs who want to stay updated with latest blog posts, subscribe to the email newsletter. Blog administrators use difference email delivery systems such as Feedburner, Awber or mailchimp to send email updates to their readers. Blogs provide great navigation to its visitors thanks to the use of Categories and tags. Categories classify the blog topics into different groups and tags classify them into sub-groups. Users can then read their topics of interest with the help of these category pages. If you observe our blog menu at the top, you will find that, we have organized our content into different labels/categories. This helps you to better navigate our site. 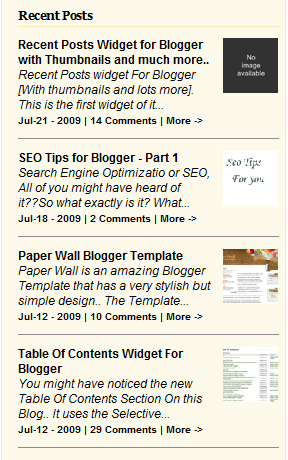 A blog will always display its newest blog posts at top and oldest at bottom. This sequence is adopted for both blog posts and comments, so that the readers could reach newly published articles on homepage easily. 5. Unlike a Website, a Blog Can Be Managed by a Single Author! You don't need a big team to manage a blog. This is one reason why blogs have become the best source of online earning for enthusiastic people who love to share their knowledge with the rest of the world. I started this blog all alone and I am running it for over 8 years without a big team. You can surely increase the number of authors on a blog to publish content more frequently. Large corporate blogs have no more than 10-15 bloggers on its editorial board, who publish content regularly. create a free blog on Blogger, Tumblr or even Wordpress. Unlike building a website, you don't need to have advanced technical skills such as web development or knowledge of web hosting or FTP to start a blog. Thanks to free blogging platforms like Blogger, you can start your blog without worrying about the coding part! Let me know if you need any further clarification on the differences between a Blog and website. I would love to hear from you and help you with all your queries. To get slightly off topic here, we also recently posted : How To Find Ideas For Blog Posts Daily?. So while writing this post, I feel like making another one for 'Importance of Blog over a Website'. :) As there are many things that I should keep safe for the next posts. Differences between the two content sharing techniques could be better explained there. Hope this posts gave a general overview. Guest Post by Hassam Ahmad Awan. Content was edited and updated on March, 2017 by MBT's editorial team. In a sense, we have to thank the first generation of programmers and developers. They were the ones that created countless number of web blogs to record and share their codes and coding experiences with other developers. If not for them, the WWW might not have stumbled upon the joy of blogging.
" Website is a Web page which provides any Service ( Like Facebook ) and a Blog is a Web page which gives Informations and Articles on daily basis ( Like Youtube, Twitter ) "
I love history too :) The work of early programmers is worth appreciating in what we are enjoying today. Yeh that would be more appropriate for the next post in line that i mentioned about. Thanks for reminding. How do you guyz add the top bar ??
" Dear Readers! If MBT has helped you a little then kindly show your love by voting @ "PakistanBlogAwards" "
You differentiated finely between blog and website, nowadays there is also another concept of niche website which is more or less like a blog bcoz it focuses on contents and their regular updates and it is nothing like a news website. Want to know a sample of such site visit www.pollutionpollution.com where I tried my best to stay focus on one issue but keep updating it. Thank you so much, I was really confused! i am just starting to learn a bit about web. I have always wanted to work on web. Thnx guys 4 ur ideas. It helps me a lot. Hi, i must say you did a very good job here by your diffreciations of both blog and a website, i got this site while doing some research for my site http://actionblogging.com.this article will stand the taste of time. Thanks for the tips. Philip. Iam new to all these. can you plz alloberate on this " The major content of website remains the same. Though the webmaster could add additional pages to the website to increase the content, but the order by which the information is presented could not be later changed." This was somewhat helpful but would be moreso if they assumed they were talking to complete beginners, people who are not at all savvy with any of this, any of the terms and language. Like define static page or "url". ?? But still a good post. I thought though this post would have listed more pros and cons for both. Searching the difference between blog and website from a while and my search ends on your blog. Now i know the difference between my blog (http://trickjunction) and website. Can you use your blog as website or website as blog. What is differences blog with site or web with site? blog is a type of a website (Web log= Blog). Website is a general term. (site on web=website).